After reading the post on How to Read Causal Loop Diagrams, quiz your self on what you’ve learned. The answers are at the end of the post. Please leave us a comment if you have any questions or suggestions on how we can make our learning materials more useful! Quiz yourself with the following questions and then check the following section for the answers! 1. Somebody uses the following causal relationship in a model about traffic. In words what does it say? 2. In a model about racial tension, you see the following relationship. How would you read it out loud? 3. 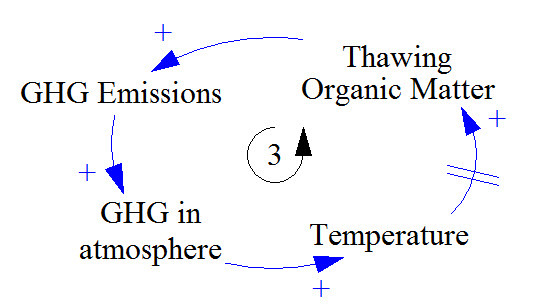 The following feedback loop comes from a model of about how greenhouse gases (GHG) interact with climate change. Walk through the feedback loop verbally and then determine if it is balancing or reinforcing. 4-6. 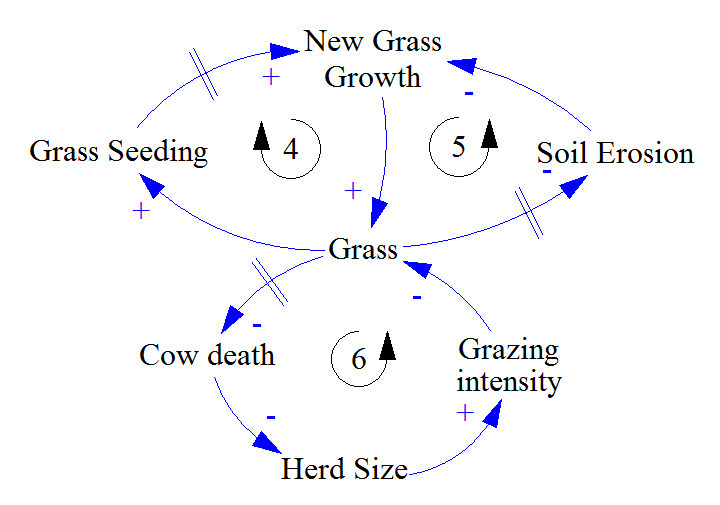 The following model shows the interaction between cows and the fields they graze. Walk through each feedback loop and determine whether it is balancing or reinforcing. 1. More Traffic Density leads to a decrease in Speed … OR less Traffic Density leads to an increase in Speed. 2. More Inequality leads to more Conflict … OR less Inequality leads to less Conflict. 3. You can begin with any variable in this loop either increasing or decreasing and then work your way around. For example, more GHG emissions lead to more GHGs in the atmosphere which lead to an increase in Temperature which leads to more Thawing Organic Matter (that was previously trapped frozen in glaciers) which in turn leads to more GHG emissions. This is a Reinforcing Loop because an initial increase in the starting variable led to a further increase down the line. 4. More Grass leads to more Grass Seeding which leads to more New Grass Growth which become more Grass… OR Less Grass leads to less Grass Seeding which leads to less New Grass Growth which leads to less Grass in the future. Since more Grass leads to more Grass or less Grass leads to less Grass. This is a Reinforcing Loop. 5. More Grass leads to less Soil Erosion which leads to more New Grass Growth which in turn leads to more Grass… OR Less Grass leads to more Soil Erosion which leads to less New Grass Growth which in turn leads to less Grass. This is a Reinforcing Loop. 6. More Grass leads less Cattle Death which leads to a larger Herd Size which leads to a higher Grazing Intensity which leads to less Grass … OR Less Grass leads to more Cattle Death which leads to a smaller Herd Size which leads to a lower Grazing Intensity which leads to more Grass. This is a Balancing Loop since more grass leads to less grass over time or less grass leads to more. Very helpful and learning. You should have more of such activities here. It helped me to clear many confusions. God Bless You! Helpful quiz! Learned to read CLD in a short period. Am looking for more. Thank you so much, I was understanding Senge (assigned course reader), but I was’t able to articulate my understanding. I think that the biggest problem that I ran into with understanding CLD’s while reading Senge is that he did not describe the polarities attributed to the reationships between variables. Thank you. Simple and easy to understand especially for beginner like me.